The European Union Ambassador to Fiji and the Pacific Andrew Jacobs (left), The Pacific Islands Private Sector Organisation (PIPSO) Chairperson, Howard Politini with permanent secretary for the Agriculture Ministry, Jitendra Singh at the Tanoa Plaza Hotel in Suva yesterday. Photo: VILIMONI VAGANALAU. The Pacific Islands Private Sector Organisation (PIPSO), in partnership with the African Caribbean and Pacific-European Union- Technical Barriers for Trade (ACP-EU TBT Programme) held a validation workshop yesterday. The workshops aimed at enhancing trade capacities of Pacific Agribusiness and improve access to international markets. The European Union Ambassador to Fiji and the Pacific Andrew Jacobs said agribusiness sector was important to all Pacific Islands countries and European Union as well. “Agribusiness sector is of critical importance both for the Pacific and the European Union and there is great opportunity for increased trading amongst Pacific Island Countries,” Mr Jacobs said. He added there was a big opportunity for export of good to other countries in the world as well. “Pacific products are real quality products and have a very strong Pacific Brand,” he said. 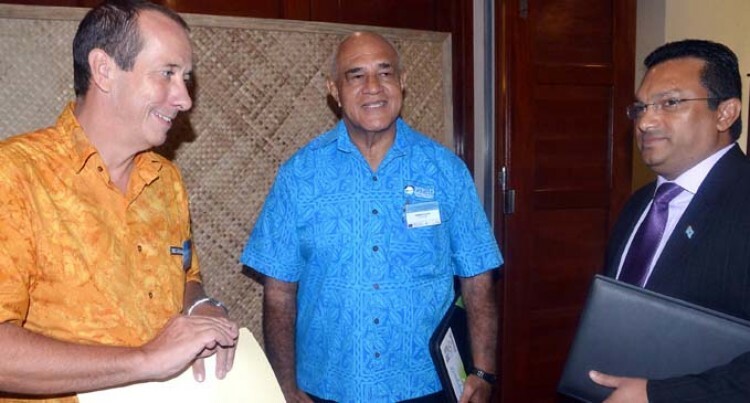 Chairperson for PIPSO, Howard Politini said the future of Pacific Island Countries was heavily dependent on agriculture and its natural resources. “This workshop needs to be complemented as farmers and exporters will be able to gather a lot of information on best practices they need to follow when exporting to other countries,” Mr Politini said. He added getting a job in urban areas was almost impossible, therefore, other options should be considered. The workshop was attended by participants from the ACP-EU TBT Programme, PIPSO, the European Union, the Ministry of Agriculture and Ministry of Health in Fiji, the Ministry of Agriculture and Food, Forestry and Fisheries in Tonga and representatives of the private sector.